Wondering what to do in Rome? The Romans say, non basta una vita!, which means, "A lifetime is not enough!" I live here, and I have to agree. What to do in Rome - a lifetime is not enough! It's true, there really is always something new to see and do in Rome. Tourism in Rome is my business and my life. Even I am always discovering new things. My husband is from Rome, and he is often discovering new things along with me! Santa Maria Antiqua in the Roman Forum - the "Sistine Chapel of the Medieval", was only opened to the public in 2016. There are always new things to see and do in Rome! Are you wondering if you should even visit Rome on your trip to Italy or Europe? Rome is so much more than just a city to fly into or out of, as I once did. The more time you spend in Rome, the more you want to see. Rome has over 2000 years of history, and you will find a rich wealth of art, architecture, and archeology, not to mention shopping and my favorite pastime in Rome: eating! But you are visiting and want to know how to plan your stay. Whether you have planned a short break to Rome or a 2-week trip; whether it's your first time in Rome or your 5th, I've got lots of suggestions for you! I find the most typical visit to Rome is about 2 1/2 - 3 days. Are you looking for tours in Rome? Start on my main tour page here. It is possible to see the above sites in a 2-3 day visit to Rome. But there is so much more to see. The more time you spend in Rome, the more you realize you need more time here! So if you are not sure how much time you should spend in Rome, I'd suggest you try to add at least one more day if you can. Have you already been to Rome? Do you have more than 3 days in Rome? If so, then you may want to consider what to do in Rome besides visiting the above sites and monuments. Where I eat and drink on a trip has a huge bearing on how much I enjoy the place I visit. And in a city like Rome, where eating is practically an art form, and where drinking wine, coffee and more recently, the "aperitivo" is part of the joys of life, we are blessed to have more options than ever before. Want even more detailed things to Do in Rome? See how many great things to do in Rome there are? It's always a good idea to add another day or two on to your trip to Rome. There are hundreds of museums in Rome. Like the extraordinary collection of stained glass in the Casina delle Civette inside the Villa Torlonia, Mussolini's old party pad. Never heard of it? Visit my page about Museums in Rome for ideas and details, including which museums participate in the Roma Pass. You can easily fit in some shopping even on a 2-3 day visit to Rome. Want to know where the best shopping is? Visit my ultimate guide to Shopping in Rome. 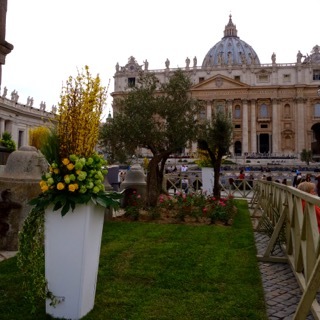 If you want to see the pope while you are in Rome, you might still be able to fit it in, even for a short visit. Pope Francis rides through the crowds after he gives the Papal Audience. Find out more about Seeing the Pope in Rome. Want tickets to the Papal Audience or Papal Masses? Click here. Visiting the Vatican is at the top of most people's list of what to do in Rome. I've got lots of pages just about this! Rome has mostly mild weather although we do get cold and rainy winters. But even in winter, you can enjoy some lots of outdoor activities in Rome. Some people plan their trips to Rome around a specific music or sports event. Every year we see people booking long in advance for weekends there are Six-Nations Rugby matches held in Rome. Or for the Rome Marathon, held every year in March. We also get some pretty big-name concerts in Rome, such as the Rolling Stones, Madonna and Paul McCartney. But even if you didn't plan for it, there are always lots of great things happening in Rome. To find out more about Events in Rome, visit the official Rome tourist board website. Most of the itineraries I have seen suggested for Rome include visits to the main sites (see top list), spread out over 1-4 days. At our Rome boutique hotel, we've helped thousands of visitors get the most out of their stay, according to their tastes. So I have really seen the gamut of requests for what do in Rome. I have dedicated many pages to this, as there is more than just one standard answer!